The Institute for Community Health and Wellbeing would like to thank you for your generous donation towards the “Support CSUN’s Moms” fundraiser. Your donation will have an impact on improving the lactation accommodations available on the CSUN campus. As the fundraiser has concluded, the Institute for Community Health and Wellbeing will continue our work in improving lactation accommodations for students and promoting the health and wellbeing of the CSUN community. Thank you for supporting this project! This page has closed, but you can still make an impact. Give by calling 818-677-7330 or visiting http://givenow.csun.edu and entering "University Special Projects" in the Special Instructions field. CSUN is a national leader in inclusivity and is dedicated to providing its students with quality of life that elevates their ability to learn and earn a degree. an obstacle to education for students and work efficiency for faculty and staff who are mothers. It could also cause added stress, which may discourage or interfere with a woman's choice to breastfeed. CSUN has found a unique way to better serve a very sensitive need. 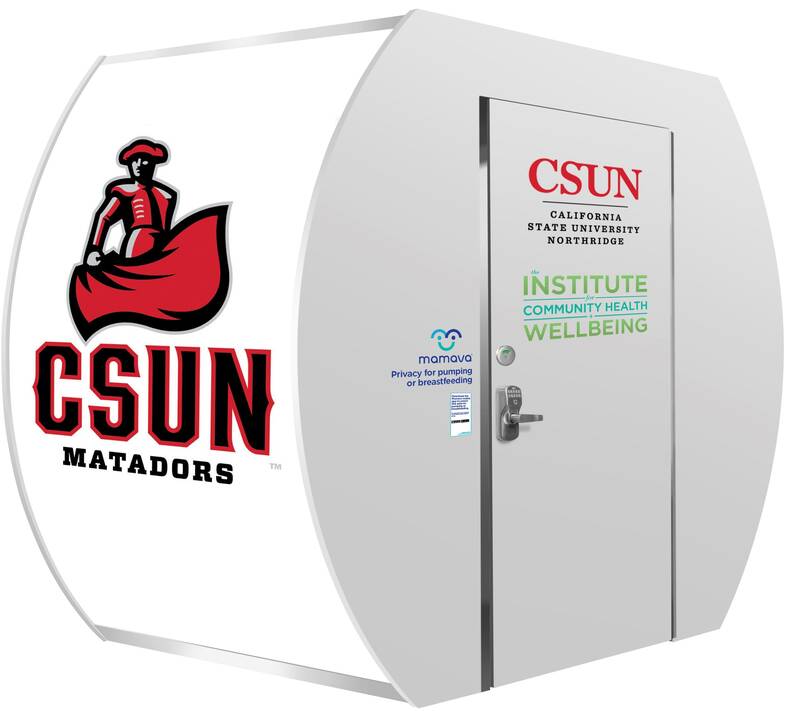 CSUN has four designated lactation spaces on campus, but to ensure that we accommodate as many students, faculty and staff as possible and meet the growing demand for appointments, the university asks you to help raise funds for a Mamava Lactation Pod — a private mobile lactation space that CSUN could place in the highest area of need. These pods are comfortable, high-tech and clean — operating on an app-based appointment system. According to the data and feedback from clients, CSUN needs more space, especially on the northwest side of campus. The high demand for the four existing lactation spaces on campus presents a challenge for those mothers, who some, have a brief period between classes. Because of this and other reasons, mothers have rushed to CSUN bathrooms, where their privacy is limited, to express their milk. CSUN's Institute for Community Health and Wellbeing recorded nearly 400 appointments during the Spring 2018 semester. A survey taken by the Institute shows that each appointment takes approximately a half hour illustrating how high the demand is. CSUN would become the first university in the Cal State system with a Mamava, and join one of 500 locations in the United States, which includes airports, professional sports stadiums and health centers. Your donation could help CSUN provide more flexibility to new moms on campus and serve as an encouraging resource for mothers pursuing their education while also reaping the benefits of breastfeeding. Give $400 to represent the 400 appointments made to the Institute last semester by nursing mothers.